Can I import/use my own product spreadsheet? You can use EITHER the Xpress Lister import template OR your own product spreadsheet that's likely in a completely different format. Xpress Lister supports importing your own product catalogue without reformatting. 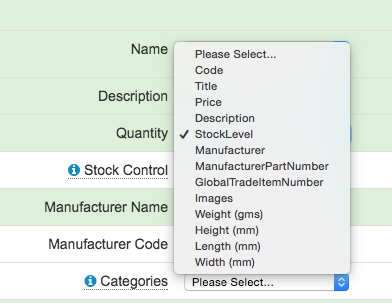 During the import process, you will be asked to 'map' your spreadsheet columns to the values Xpress Lister needs to create eBay listings. You can either Drag & Drop your data file into the box with the dashed border, or click the Choose File button to browse your computer for the file. The screen shots shown in this section are based on the sample file. If you are using your own file, the field names in the Import Field column will be different, but the concepts are the same. XpressLister automatically maps fields based on commonly used field names. When a field is mapped, the background is green. Unmapped fields have a white background. In the image above, Product Code is mapped to the Code column of the spreadsheet, Name to Title and Description to Description. These mapping happen automatically. The Quantity Field is not mapped. The Import Field column shows "Please Select...". Clicking the drop down list shows all available columns in the import file. Choosing StockLevel maps the field. If the "Overwrite Existing Products" checkbox is ticked, products in the import file with matching product code will be updated with the data in the import file. This feature is particularly useful for updating prices and stock levels based on an external system. Click the Import button to complete the import. A summary of the import is displayed. It will list any issues including which products where not imported with a reason. Review the "Issues during import" section to see if any changes need to be made to the import file before importing again. Click Close to finish and refresh Xpress Grid with the updated data.